Northdown Intergroup, is inviting us all to a centenary meeting in Winchester Cathedral. 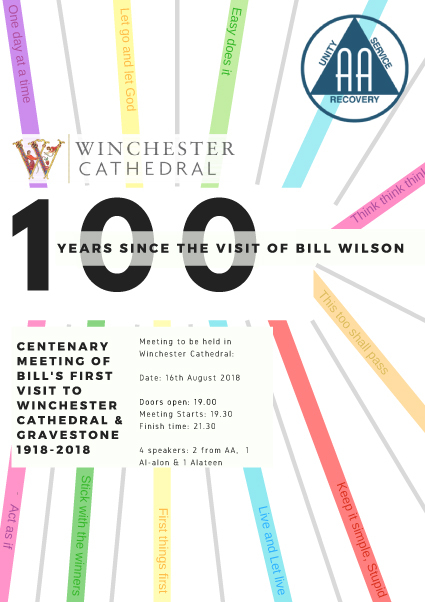 This is the centenary year of Bill Wilson’s first visit to Winchester as part of the US Army. It was in 1918 that Bill visited Winchester Cathedral and saw Thomas Thetcher’s headstone (the Hampshire Grenadier), a memory which remained with him and is mentioned on Page 1 of our Big Book. To celebrate this, Northdown Intergroup is holding a meeting in Winchester Cathedral, on Thursday 16th August, meeting starting at 7:30pm, details in the flyer attached. There will be teas and coffees available and the doors will open at 7:00pm. The meeting is being held in the Nave of the Cathedral.